culture360.org contributor Deepak Srinivasan reports on the Asian perspectives and European experiences from the Ready to Change? 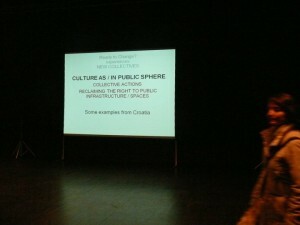 Conference held in Ljubljana, December 2010, with 2 video interviews and his personal analysis on the role of culture in society. Culture and its meanings have come a long way. By presenting certain dominant regional identities as common identity, many nations built political democracies over the latter half of the 20th century. Such cultural identities have communicated cultural meanings in narrower ways and have led to exclusion of many other forms of cultural expression and thought. Local culture(s) have thus been conveniently packaged, patronized, legitimated, delegitimized or marginalized by nation states, whether in Europe or Asia. The fast paced 20th century experienced a shift from classical culture towards urban culture. Urban spaces thus became modern sites of exhibition and nations showcased urban culture with national pride. After decades of practice and academic study (leading to feedback and critique) culture is now being reexamined and understood as the common connecting and causal element for ecological, psychological, political, sociological and economic aspects of societal existence. The meanings for culture and cultural practice are expanding. Since the implication of modern 20th century industrialization and the subsequent implication of transnational politics and commerce in environmental damage, cultural processes have taken center-stage in addressing issues centric to 21st century development. It is also becoming increasingly apparent that the role of culture is not plainly a mere presentation of art and cultural products. Critical examination of cultural practice within areas such as education, employment, economy, infrastructure, ecology and governance is the emerging focus. This necessitates the envisioning of sustainable development and social justice through the lens of culture. Partners of the Sostenuto forum (http://sostenuto.wikispaces.com/), an EU initiative that currently explores the role of culture in growth and progress, proposed the Ready to Change? Conference organized and hosted by Bunker, (a non-profit arts and culture organisation based in Ljubljana, http://www.bunker.si/slo/). The intention to create this forum was to hold a dialogue on the present day role for culture. The conference held in Ljubljana, Slovenia between 2-4th December 2010, saw various cultural sector actors & representatives such as practicing artists, researchers, academics, media practitioners and policy makers come together to share and reflect on changing meanings, functionality and vision for the sector. The conference drew from various practices in many Mediterranean countries and the rest of Europe with some representatives from Asia, the Middle East, Russia, United States and Africa also attending. Most practitioners at the forum had chosen to critically navigate the cultural space of modern nations they inhabited. At forums of national and international interest, culture has been treated as merely a decorative social appendage. More recently, past the recent economic crisis, culture has been in discussions on sustainability related issues- like ecology, economy and governance. The interesting emergence of culture in addressing core social processes has also led to exploring the role of culture in social justice. We are thus defining culture more broadly by expanding older notions of culture to be niche “creative”, artistic, societal space, to participation in public and decision making circles. Nancy Duxbury further lists four aspects of culture focused upon by governments & decision-making bodies and subject to academic intrigue. Duxbury’s presentation ended with an emphasis on factoring community participation and community rituals. Rituals, rooted in everyday cultural practice are crucial to sustain changes that artists and eco-art projects propose. Since a vast majority of such projects don’t involve community, working towards creating contexts for community festivals, processions and rituals acquires priority. Summarising her presentation to reflect on three processes for sustainability, Duxbury suggested a three-step process as way forward in social and political inclusion of culture. Cultural advocate and director of POGON (Croatia), Emina Visnic’s presentation further expanded culture’s meaning and role. Visnic elaborated on the identity of the artist in a globalised world as comprising of responsive citizenship; responding to social milieu by seeking imaginative methods for social justice. Hinging on the importance of art as public practice & located in the public sphere, Emina Vinsnic who drew from habermassean principles mentioned that culture had its own preconditions while forming and participating in this public sphere. Voicing concern over the concurrent era of corporatized media and hyper-entertainment, Visnic emphasised the need for independent and community owned media practice. Drawing parallels and connections to cultural thinking and practice in India, one sees similar trends- curatorial and classical approaches to arts and field of culture undergoing change in the past couple of decades. While gallery culture and non-collaborative, market driven art practices still dominate and stand their ground, a few institutions of art and independent practitioners have begun questioning the role of arts in social, political and ecological spaces. This is not to say that the trend of using arts and cultural practice in areas of social work is fairly new to Asia. Grassroots NGOs, others who work in areas of community service and Left parties have consistently used cultural practices in their communication and processes of dialogue. Folk music and theatre particularly, have been used extensively both by rural and urban community workers. It is only more recent that artists have chosen to descend into social space and locate their practice in public spheres, and are taking note of existing cultural practice in the social work sector. This has led to a few somewhat harsh clash and critique centered on aesthetics and form while other interactions have led to collaborations between artists and activists. In Europe however, it seems like the development sector has only recently begun to speak to artists and engage with creative processes, but the collaborations are rather different. Another example from the Ready to Change? Forum, Alban Congrel’s presentation stands out due to its successful and on going regional collaboration with NGO sectors and cultural practitioners in France. Alban Congrel’s work as researcher studying the cluster Les Articulteurs (formed in a territory in Brittany, France) demonstrates more specifically, the role of culture in regional socio-economic development. Describing free access to culture for everyone as a fight against exclusion, Congrel focused on the formation of a diverse cluster of cultural actors called Les Articulteurs. One often wonders about the role of “soft” culture in “hard” socio-economic spaces of politics, governance and sustenance. The role of Les Articulteurs demonstrates socio-economic impact of cultural work in a region with a strong cultural confluence, but no prior initiative in cooperation. Les Articulteurs formed between 2004-2008 in the dynamic Redon region- the overlapping region/divisions between three provinces in South France. In 2004, equal funding for territorial development and possibility of collaborative activities led to defining, quite remarkably, culture as the core of territory development for the region. Discourses on cultural economy coupled with free access to culture movements brought together diverse partners: performers, dances, civil society groups and others to try and engage together through a process of experimentation. Les Articulteurs, a ‘cultural’ cluster with diverse players that looked at the socio-economic ecosystem was thus formed. 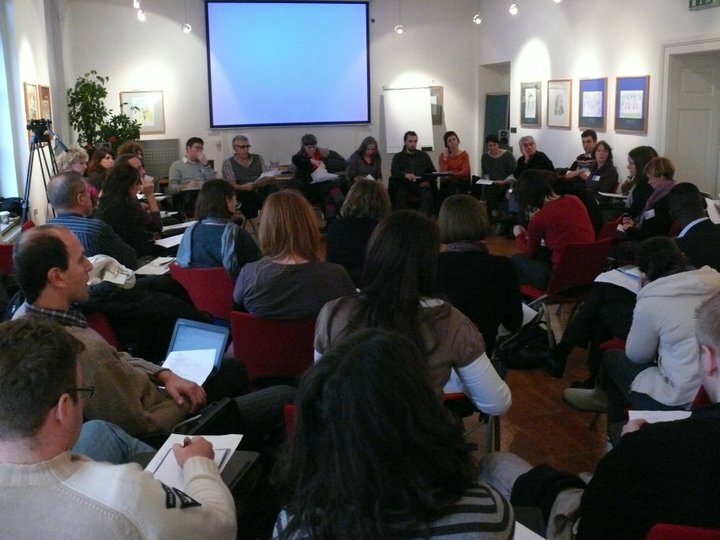 The cluster worked with paradigms such as indicators of employment and issues of inclusion and used methods from art and media practices such as re-engaging and supporting the growth of historical archives of the region and supporting participative community processes through art residencies. In parallel, the cluster also sought to collect research data on local social dynamics. In Alban Congrel’s words, the laboratory was a dialogue and experimentation space for both the cultural and economic. This process also aimed to facilitate specific governance practices and territory development. The cluster demonstrates the capacity of various actors to work together, and develop specific responses as stakeholders. While they do so, they collate and operationalise local resources, develop creative approaches to concerns in context of the specific region/territory. The Les Articulteurs example is very unique and interesting for reasons such as the coming together of culture both in terms of recognition in legislative articulation as well as demonstrative dialogue between diverse socio-cultural sectors. In India, there is emerging dialogue between cultural practitioners and activists on critical issues that demand collective attention. Yet, we seem to be far from being a critical mass with informed public opinion. The role of culture in shaping discourses and practices for sustainable and equitable growth and development is far from being discussed. Smaller artist and academic circles however, have begun engaging with the question of cultural practices, sustainability and imagination. Only recently, the Ministry of Culture in India chose to more seriously engage contemporary players in culture (classical forms have always been the focus). It is however, a rather interesting time in Asia, with dialogues on the political, economic and sustainable processes running in parallel within smaller groups, diverse collectives and coalitions. From the various examples described above at the Ready for Change? forum, examples of dialogue and discussion in areas of culture and development seem very heartening for an Asian-Indian such as myself. In Bangalore, discussions on the role of culture happen within very few circles of cultural practitioners. This lack of dialogue is coupled to conspicuous absence of any political intent and commitment. Not only has it been a problem to initiate and develop discourses on the role of culture within developmental paradigms and questions of sustainability, the process of inter-practitioner dialogues between various cultural practitioners has been equally tedious. To create perception of need towards such activities (which would lead to more support and funding for such initiatives) is a hard task. Moreover, the role of culture in social justice and ecological issues has been much under-explored in India by contemporary art practitioners. Essentially, being able to view models for action, discourse and dialogue at the Bunker hosted Sostenuto event seems to verify the need to urgently seek in Asia, partnerships between inter-cultural and inter-sectoral fields. There is as well the need to support cross national resource sharing and collaborations, particularly focusing on cultural operatives and participative economic & political dialogue. Deepak Srinivasan is an artist, media practitioner, researcher and pedagogue, currently a core member of Maraa (www.maraa.in), a media & arts collective based in Bangalore and faculty at Srishti School of Art, Design and Technology, Bangalore (www.srishti.ac.in). After a Bachelor's degree in environmental sciences and an MS in neurobiology, his interests shifted to exploring the role of performance as method for trans-disciplinary inquiry. Since 2005, he has been training in performing arts and community theatre. Deepak’s experience in media comes from his days as content developer with Worldspace Satellite Radio. Media and art practice have become an emerging focus for Deepak and help to better understand the role of culture in emerging political negotiations and identities.